Ucanews.com reported that the new terminology on how to refer to Cardinal Zen was part of a broader list of words and phrases to be “banned or used with care,” which state-run Xinhua News Agency announced to media workers in China. “‘Former bishop’ instead of ’emeritus bishop’ should be used to address Zen Ze-kiun and other retired bishops of the Hong Kong Catholic Diocese,” said point No. 48, according to the list posted by several Chinese media. 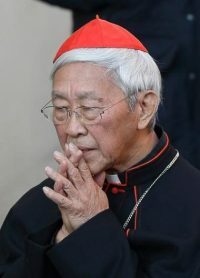 Cardinal Zen, who retired as bishop of Hong Kong in April 2009, is well known for his loathing of the ruling Communist Party. He has spoken out on political freedom, human rights and religious persecution, especially during his six-and-half-years as bishop of Hong Kong. Since then, the cardinal has continued his advocacy efforts, and his willingness to get involved in debates over the territory’s political future has made him a favorite of pro-democracy groups in Hong Kong. Most recently he spoke about the communist government’s treatment of Liu Xiaobo, the Nobel Laureate who died July 13. Ucanews.com reported the word ban has riled several mainland Catholic bloggers, already dealing with a ban on using virtual private networks, a tool that they use to avoid China’s so-called Great Firewall internet censorship. “Emeritus bishop. So, come and arrest me?” challenged a Catholic blogger on social media. The first 45 points in the list of banned words in news coverage were released in November 2015. The revised list has been circulating since July 19, adding 57 more points and updated as of July 2016 — but only recently leaked to other media. Cardinal Zen is the only Catholic figure named in the list. He is one of two religious figures whose names were spelled out, the other figure being Muhammad, the founder of Islam. The list reminded reporters to address the full name of people whose surname is also Muhammad, to distinguish them from the Prophet. Five out of eight points on religions and ethnicity related to Islam, such as not to equate the Hui ethnic group as Muslim; not to use “kill” but “slaughter” of cattle by Muslims; and not to mention pigs in stories related to Muslim faith. These points were already part of the 2015 list.